India is currently rolling out the largest digital radio deployment worldwide, as the public service broadcaster All India Radio (AIR) is upgrading the country’s terrestrial broadcast infrastructure for the future. The broadcast standard of choice for this project is Digital Radio Mondiale (DRM), the universal, open digital broadcasting standard for all coverage needs. DRM ensures an efficient and complete digitization of radio in India, no matter if the services are local or regional, nationwide or even international, and with the latest features such as Journaline advanced text services and service selection via station logo. The transition from legacy analog broadcasts to digital radio for the nationwide radio network in the former AM bands is seamless, as AIR is updating the existing transmitter infrastructure while offering analogue-digital simulcast services at the same time. Most recently, the digital encoders themselves have been upgraded with DRM’s mandatory audio codec xHE-AAC and were re-located to the studio for the best audio source quality. This upgrade process has already been carried out for the five most relevant AIR transmission sites. Besides enabling more and higher-quality audio services per DRM transmission, the new xHE-AAC codec also allows broadcasters to benefit from a simplified broadcast head-end configuration, as all audio parameters are automatically streamlined internally by the xHE-AAC encoder. And xHE-AAC is equally optimized for speech and music content, which eliminates the need to change configuration settings depending on the current type of audio content being broadcast. When the analogue AM transmitters were first digitized several years ago, HE-AACv2 was the codec in use. However, once MPEG released its new xHE-AAC standard, DRM was the first global standard to adopt the new codec and update its system specification. By now, the most recent addition to the AAC codec family is on the air in India: already, the first five major transmitter locations in India – Delhi (2), Bangalore, Pune and Chennai – have been upgraded with xHE-AAC-enabled DRM equipment by RFmondial with Fraunhofer technology components inside. In total, there are 39 transmitter locations (including 35 transmitters that form the domestic medium-wave network), which all are expected to receive this latest upgrade moving forward. xHE-AAC makes it possible to provide much better, FM-like audio quality, as well as more programs in a single DRM transmission – up to three instead of one. The upgraded DRM encoder equipment also supports the provision of detailed textual information like current news, information, program schedules, traffic updates and contact information via DRM’s Journaline advanced text service. Eventually – based on DRM’s Emergency Warning Functionality (EWF) – AIR’s DRM transmission network will be tightly integrated into the national infrastructure for disaster management and alert dissemination, which is currently being established based on the international CAP (Common Alerting Protocol) standard. 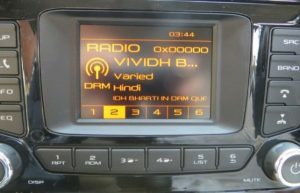 Car manufacturers are also doing their part to enable Indian consumers to enjoy the new DRM-based digital radio services: recent reports say that the by mid-2018 the number of cars equipped with DRM radio sets had already surpassed the one million mark. Different from most countries with digital radio services being rolled out, all those radio sets come with DRM as a default functionality, without extra cost to the consumer. Most leading car brands have either already incorporated DRM into their vehicles, or are in the process of doing so. As for stand-alone DRM receivers, Fraunhofer IIS is working closely with domestic and international manufacturers to bring new receiver models to the Indian market, offering full advanced DRM functionality at a very competitive price point. With the digitized medium- and short-wave transmissions for nationwide and international service coverage up and running, the next step is to digitize the local radio services in the FM band. The Telecom Regulatory Authority of India (TRAI) issued a recommendation in 2018 based on feedback from all stakeholders in India, including the private FM broadcast industry. A roadmap announcement by the Indian government is expected. The use of xHE-AAC in DRM and the codec’s suitability for adaptive web streaming to mobile phones enable Indian broadcasters to bring the two worlds of radio and streaming together for the first time. The integrated broadcast solution offers a seamless user experience and reaches listeners on all classes of devices, from stand-alone radios to cars and mobile phones. In addition, more and more receiver models will combine the two distribution paths on a single device – no matter if it’s a mobile phone with built-in digital radio reception, a car with a multi-mode receiver solution or a stand-alone desktop radio with built-in WiFi streaming. And this is how it works: as long as the listener remains in a radio station’s coverage area, they can enjoy the free-to-air DRM service, its sound quality and features. While travelling or in challenging reception conditions, the device can then automatically switch to the station’s xHE-AAC live stream on the Internet – and back to the DRM-based broadcast service as soon as the listener re-enters the reach of the DRM transmitter. This enables uninterrupted, high-quality radio entertainment even on the move. In addition to audio programs, DRM and Internet radio services also offer various shared program-accompanying data applications like news feeds, program information or album art. DRM’s claim that the adoption of xHE-AAC will align digital radio with the world of modern consumer devices was recently proven right when it was announced that support for xHE-AAC audio decoding will be a default feature of the Android platform from version 9 (“Pie”) onwards. Fitting with this new development, Fraunhofer has recently demonstrated DRM receiver support on Android based mobile phones using its Fraunhofer DRM MultimediaPlayer Radio App.